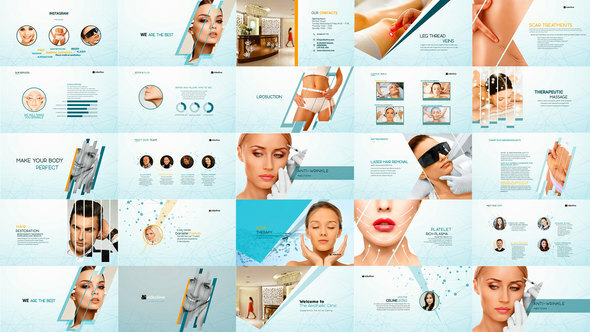 Aesthetic Healthcare Presentation: The project is easy to use in the work. Perfect for beauty salon slideshow, medical centre promo, healthcare center presentation, aesthetic clinic center cannel. 2. Insert screens your app. 3. Your app promo done! Medical Promo – Aesthetic Healthcare Presentation, unique pack contain 23 elegant full HD scenes. Easy edit a controller which can easily change the color scheme of the entire project. Free e-mail support: havin’ trouble with my template? Always happy to help! Customization service available! Do you want me to customize the presentation template for you? Just contact me throught the form on my profile page. Medical Presentation – Aesthetic Healthcare Promo and Enjoy! My project Medical Presentation – Aesthetic Healthcare Promo perfect for healty laser hair removal, services consultation, botox, filler, liposuction, medical clinic, healty promo, beauty salon promo, medical healthcare center, medical centre presentation, medical laser hair removal, healthcare clinic, aesthetic clinic corporate presentation, healthcare & medicine promo, chemical trailer, medical servic, medical product in doctor’s hand, aesthetic beauty woman. F5 Design offers premium after effects templates that are perfect for creating ads , intros , commercials , presentations . Templates are very well organized with placeholders for each image and text , all in order to make your editing job easier and less time consuming. F5-Design.com - After Effects Templates © 2015. All Rights Reserved. Have you checked our premium After Effects Templates ? Before leaving we invite you to take a look at our premium after effects templates. You could use them to create ads, intros, presentations.